Allegra Boverman/Gloucester Daily Times. 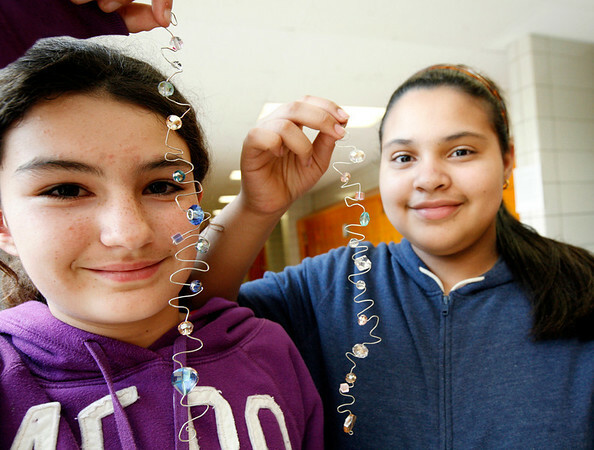 During the jewelry making afterschool program at O'Maley Innovation Middle School on Monday, Faith Doucette, left, a sixth grader, and Chrisbel Mercado, a seventh grader, show the suncatchers they created. Students also made necklaces, earrings, bracelets, their own charms, key chains and special sets of jewelry for Mother's Day.